(FORT BEND) – They say it takes a village. For Darryl Jackson, or DJ, as most people know him, that could not be more true. 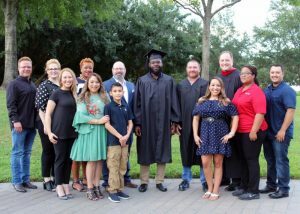 Thursday night was life changing because the 22-year-old graduated with his certificate in Electrical Lineworker Technology from Texas State Technical College – a feat that not long ago seemed impossible for this young homeless man. But Jackson is not a statistic. Instead, he is defying all odds. The Houston native was taken away from his mother because of her drug addiction and his father was never in the picture. Jackson grew up in the foster care system and suffered some abuse. At 18, he aged out, like many teens in the system do. He found himself out in the streets with no place to live, no food to eat and no money for even his most basic needs. Jackson spent one year at a homeless shelter. Then went from couch-to-couch, living with different friends. Then, finally a break. One of his friends invited him to visit TSTC for registration. That was the day that changed Jackson’s life forever. And although he said he had no idea what a lineworker was or did, he signed up for the program anyways. He figured he had nothing to lose. Enter Troy Eads, TSTC’s Electrical Lineworker Technology instructor. Jackson credits Eads for much of what he has been able to achieve. As a young homeless man, school was not a priority, survival was. And although Jackson received financial aid and scholarships such as TSTC’s Texan Success Scholarship, it was only enough for tuition and books. He was still homeless and without enough to eat. Jackson would stay with Eads occasionally, but help also came from Carolyn Arnim from Friendship Church in Richmond, who learned about the lineworker student and his situation during one of her clothing drop-offs for TSTC’s Clothing Closet. Arnim got her whole congregation to help. The congregation from Friendship Church took Jackson in as one of their own, helping him with spiritual guidance, clothes, food and a place to stay. Between TSTC and the church sharing the cost, Jackson has been able to stay at a local motel for the past couple of semesters, and Eads picks up Jackson for class and drops him off at his room every day to ensure he has transportation. On August 27, Jackson will begin his career at CenterPoint Energy in Houston with a starting pay of $30 an hour. Jackson said with his new career he is looking forward to saving for an apartment and car, and helping his sisters who are also struggling. His long-term goals are to own a business and help others. Jackson celebrated his life-changing milestone with Eads, Arnim, Friendship Church Pastor Jason Frazier, his tenth grade teacher Sierra King and their families, all of which he credits for his success. This entry was posted in Fort Bend County on August 27, 2018 by Amanda Sotelo Sotelo.